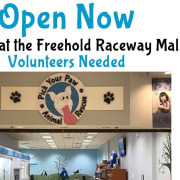 Pick Your Paw is excited about our new adoption center at Freehold Raceway Mall and are looking for volunteers! We would love to have your help to pet the dogs, walk the dogs, play with the dogs, love on the cats, clean cages, and more! We are requesting a commitment of at least 3 shifts per month. Any volunteer under 16 must be accompanied by an adult at all times in the adoption center. Minimum age to volunteer is 14. IMPORTANT: Please do not come to volunteer until we contact you. We will send you a volunteer application and waiver to sign and return prior to your first volunteer shift. We have various shifts available during mall opening hours, 7 days a week. We are requesting a minimum of 3 shifts per week. Once we receive your completed application and waiver, we will provide you with the link to sign up.